You’d expect a zombie to look a lot worse than this tidy little house. But that’s what it is — a zombie foreclosure in real estate lingo, abandoned before somebody sues to take the place. The house, at 1637 Water Ave. N.E., is on one of my bike routes. And the other day, as I was riding past, I saw that a paper notice had been fixed to the front door. I took a closer look and saw that, complying with a court decree in a foreclosure lawsuit, the Linn County sheriff plans to sell the property on Sept. 13 to the highest bidder, for cash. The owners have 180 days after that to redeem the place by paying what they owe. If they don’t, the buyer gets it. There was another notice on the door, apparently older than the first. It said the place was considered abandoned and the mortgage holder would be notified. Public records list the owners as a couple with an address in Cheyenne, Wyo., and the lender as Home Select Settlement Solutions. The firm has a Texas address and is a subsidiary of Nationstar Mortgage Co. According to the foreclosure suit, which a Portland lawyer filed on behalf of the lender in Linn County Circuit Court in July 2014, the couple took out a $110,953 loan from Sierra Pacific Mortgage Co. in October 2009. The suit says they quit making their monthly payments in September 2012. As a result, according to the foreclosure action, the amount owing on the loan now includes a principal balance of $106,482, plus annual interest at 5.375 per cent totaling nearly $11,000 when the suit was filed, plus various fees and charges. The one-story house has about 1,300 square feet. The Linn County assessor thinks it had a market value last year of $105,760, and an assessed or taxable value of $95,840. Abandoned though it might have been, the assessed value went up the maximum allowed 3 percent from 2014 to 2015. The dandelions make it look as though the yard has not been tended lately, but somebody has made sure the property taxes were paid. The tax bill last fall was $1,750, up from $1,599 the year before, and it was paid on time. 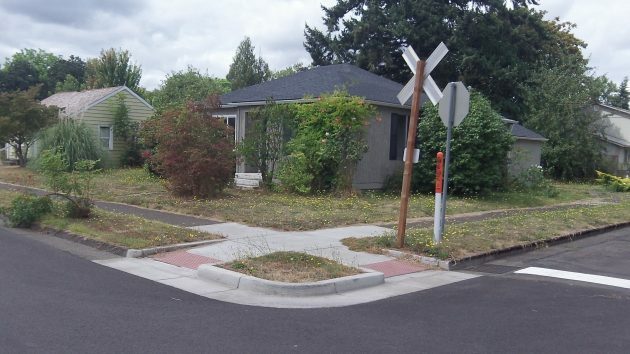 Sadly, this little bungalow is far from the only home in Albany that is under foreclosure … very sad! What a sweet place to live with a great view of the street running Oregon Electric (now Portland and Western) tracks. Technically it is a “minimal traditional”, not a bungalow. Google Street View shows how it looked in June 2012, from which It seems there are two former garages that were put to better use. Both have only north-facing windows and one has a skylight – maybe to provide bedrooms somewhat isolated from train noise? I can imagine living there with a large hedge adjoining the sidewalk, a row or two of strategically-placed bamboo, and every bit of concrete paving torn out that the city will allow – they want to reduce impervious surfaces, don’t they? Or, is it just lip service overruled to appease the car gods? Question: how often do the trains run there? How about at night? The most-telling point made in this story is the fact that Linn County is a “Leader” in home forclosures. In short, while our brilliant Commissioners, Lindsey and Tucker, are hard at work, suing the State and others over alleged shortcomings in the County Timber program, their County’s tax base continues to bleed cash. Foreclosures in Linn County skyrocket even as several Oregon counties and communities are experiencing record growth. Lindsey and Tucker are doing their best to leave a powerful legacy behind. Let us not forget that there is a the third leg of the commissioner’s stool. He is in lockstep with the two you mentioned. Why don’t you stay on topic? What do the Linn County commissioners have to do with a foreclosure in the city of Albany? Can’t speak for OP but Albany is largest town in Linn Co. Therefore, large number of foreclosures reflects upon commission contingent. On topic, I say so. No?